…The Mr. Anonymous radio show will be on vacation for the month of February…I’ll be working on music in Jamaica and Butchy will be in Hawaii. We will be back on air on the first monday of March to kick off the spring Reggae vibes…so stay tuned for good things to come. Also, Mr. Anonymous will be performing a Live ALL AGES show at the Fox Theatre on the first friday of March(3/2) to kick off their 20th anniversary month. …here’s a great review of the new album…cheers! It’s a long way from the jam band environs of Boulder Colorado to Birmingham, England, but Mr. 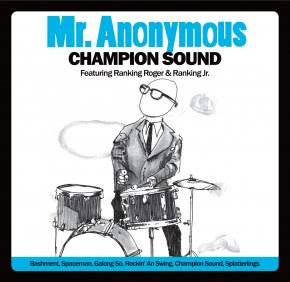 Anonymous (AKA Jeep MacNichol) has made the physical and musical journey to create and record a new album ‘Champion Sound’ with Ranking Roger and Ranking Jr. of The Beat. Calling the project, “…a mix of The Clash’s Black Market Clash and Miles Davis’s Kind Of Blue meets The Police’s ‘Regatta De Blanc,” the album is the third in a trilogy of records that MacNichol has recorded and released with a variety of his ska and reggae music heroes. His first self-titled CD called ‘Mr Anonymous’ was released in 2005. The second ‘Mr Anonymous 2? came out in 2009. MacNichol cut his musical chops as the drummer for The Samples in the 1990?s when the band was at its peak and building a large and loyal audience from its regular slot on the HORDE tour and its sold out national tours across the U.S. (featuring an unknown opening act named the Dave Matthews Band). Though The Samples fell more squarely into the jam band scene of Phish, Blues Travellers and Dave Matthews Band, MacNichol brought a strong ska and reggae sensibility to the band that can be heard throughout their music. After leaving The Samples in 1997, MacNichol recorded two solo records and toured the U.S. four times. His second solo record included Michael Rose of Black Uhuru on two tracks and this gave him the inspiration for the Mr. Anonymous project. MacNichol tracked the first ‘Mr. Anonymous’ album during a ten-week period in 2003 that involved three separate trips to Jamaica. Teaming up with music legends Sly and Robbie, Bounty Killer, Black Uhuru’s Michael Rose and Dave Wakeling from The English Beat, he created a unique blend of reggae, trip-hop and dub. He followed the first CD up with volume number two which fit nicely into the footsteps of its predecessor featuring an eclectic and creative endeavor that fuses reggae, dancehall, dub, hip-hop and electronica in unique and surprising ways. I’ve always been a huge fan of the understated majesty of ‘Good Vibe’ that MacNichol crafted for the first ‘Mr Anonymous’ album with Dave Wakeling and Michael Rose of Black Uhuru. It sounds like a lost track from ‘Special Beat Service’. I urge you to give ‘Champion Sound’ a listen (download link below). 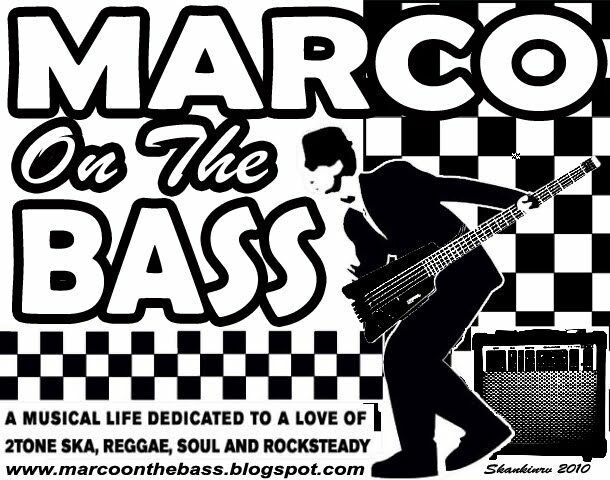 MacNichol clearly loves ska and reggae and true to form he is constantly looking for ways to expand the sound by injecting other sounds into it. While its not straight up ska or reggae, there is enough going on musically to capture the attention of open minded fans of those genres. Long-time fans of The Beat and Ranking Roger will also certainly enjoy hearing the iconic toaster and his son Ranking Jr. expanding their own musical boundaries with a sound that comes close to some of the musical experiments the original version of The Beat (see ‘Psychedelic Rockers, ‘Hit It‘) tried out. right of the video screen… looks like an arrow pointing up to the right. Having trouble viewing any of the videos or want to see them in HD? …featuring Ranking Roger and Ranking Jr.!!! why is Mr. Anonymous music free? …So i’ve been asked this question probably a million times over the past couple years, and I figure it’s as good a time as any to shed some light on my thoughts. Maybe this will inspire some of you and turn off others, but keep in mind it’s just my opinion and what’s worked for me. In a nutshell, the biggest hurdle for me in “selling” music was NOT “major labels” or the “music industry” or lack of the “right publicist” or “management” or “booking agency” or “Clear Channel” or radio stations or some invisible alien force designed to derail my career. That’s a common theme among bitter artists, and I think its a bit off of the real issue. I certainly dont think the music industry and Clear Channel have helped independent artists or paved the way for creative innovations to the masses. But regardless, we are all here now and the REALITY I think is that the biggest hurdle is technology!!! iphones and ipods and youtube and facebook and twitter and ping and pandora and bing and zing and whatever else that’s taken people’s attention spans from 10 seconds to less than a nano-second while flooding them with more information than ever. Here’s a scenario: A typical man sits at his laptop at work or home listening to PANDORA while his buddy shoots him a new music video on YOUTUBE of the latest cutting edge death metal/bluegrass dj from Bulgaria and he downloads it for free from a website that burns youtube tracks free and adds it to his IPOD library of 20,000 songs…and the tune is rocking!!! And then his 10 year old daughter walks downstairs with her new release she made on GARAGEBAND and its even more rocking and he downloads that. And the next day he gets a TWEET about the latest remix and music video from a band from Iceland while he sits on his XBOX with his son who just downloaded his best friend’s video from a Green Day concert onto his IPOD…and around and around we go. When I started my music career with The Samples in the late ’80’s/early ’90’s, there were “hypothetically” 50,000 bands that you could mostly find out about in Rolling Stone or on MTV(when they played music videos) or on the radio. Today there are probably 100 million zillion bands just in Minneapolis alone, and fans can find them all in a second on their ipod while they’re having cereal at the table(Lucky Charms perhaps). So in an effort to sneak on that ipod mix with all of the other million zillion artists, I felt like eliminating the purchase factor would be a great first step in getting seen in that nano second of attention span. People are constantly bombarded with “catchy” ads and reviews and sound bites and imagery, and I honestly dont think any of it works. I tried the traditional route with my first 2 releases, hired publicists, signed to 2 different labels and solicited every other record label in existence, management companies, and booking agencies and the result was me staring at boxes full of cd’s in my living room with less than 400 sales(no joke). They made great coffee tables, and I named one of them “Kevin”, but things ran their course. And now since my music has been free, I’ve had thousands of downloads(just hit 12,000) and there’s been a smooth free flow of my songs going directly to the ones who REALLY want to check them out. I don’t expect my fans to like everything I do, and I’m not worried about the people who haven’t heard of me. But making the music free has eliminated any hurdle for somebody new(and old) to AT LEAST take a listen, kinda like taking the hesitation out of an impulse. There’s no RISK for a first time Mr. Anonymous listen. If you like it great and if not, no worries. And now my fans are really like my own personal record company without even knowing it. They promote my music easily by sharing with their friends, and my tunes get into the ears of the people who really want them and enjoy them… and the music is still available for sale on itunes and cdbaby.com(hard copies of the cd’s) , and I actually sell more now because more people know about the music…all because its free on my website. …anyways, there it is…enough blabbin!!! …this is my new kit for 2012 to slam out some Mr. Anonymous beats…and i am PSYCHED!!! !